This course is designed to provide the students with knowledge and skills as well as develop the right attitude in modern and classical pastry and bread preparation. The diploma course teaches students competencies such as preparing, baking, and plating desserts, as well as product knowledge and pastry kitchen management. This qualification provides the skills and knowledge to be graded as a pastry chef of International breads and pastries. Students are also trained on special skills such as sugar pulling, wedding cakes, chocolate and bread art. The Australian Certificate III is issued by Culinary Solutions Australia. This certificate is recognized by the Australian government and all members of the Commonwealth Nations. This opens unparalleled opportunities and expands the horizons for ISCAHM graduates and in gaining overseas employment. 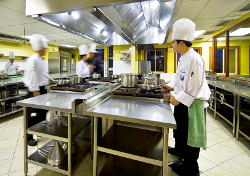 Over the years, ISCAHM has successfully produced professional chefs who hold positions as high as Executive Chef in reputable institutions here and abroad. 325'000 Pesos (appr. 4,5 lakhs INR) and the cost of living in the Philippines is comparable to that in India.